The following shows the procedure to create RDLC report using Microsoft Visual C#. Open Microsoft Visual studio, in New Project dialog box, choose Visual C#, and then choose the WPF Application template and give project name, and click OK. Note: Choose the New Project template based on your development platform. It can be a WPF, ASP.NET and Windows Forms. From the Project menu, select Add New Item, choose Class, name as SalesPersons and click Add. From the Project menu, select Build Solution. 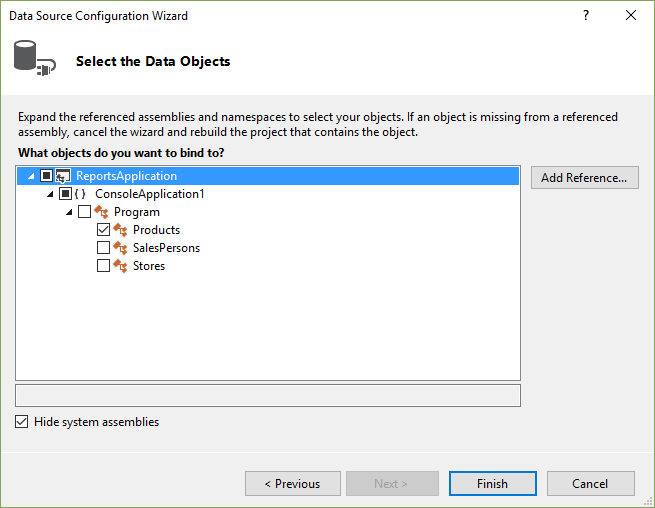 This creates an assembly for the object, which you will later use as a data source for the report. Right click on the project and go to Add New Item dialog, select Report Wizard and name as Sales Dashboard.rdlc for the report and click Add. This shows the Report Wizard dialog. In the Choose a Data Source Type page, select Object and click Next. In the Select the Data Objects page, expand the class hierarchy until you see Products in the list. Select Products and click Finish. In the Dataset Properties page, check the Available datasets box, verify that Product is selected and click Next. In the Arrange Fields page drag Name, QS1, QS2, QS3, QS4 from available fields to the Values box. Click Next twice, then click Finish. This creates the .rdlc file and opens it in designer page and displays the tablix created. Also the RDLC report can be created using Syncfusion ReportDesigner, refer to the online documentation from the below location. The created reports can be used in the Syncfusion reporting controls.